Primary Scripture Search is a tool for teaching children how to use their scriptures! By creating engaging puzzles and games that require children to open their scriptures and use the study tools included, children learn by doing something fun and entertaining! Search Slips - based on the monthly Primary theme and scripture, the search slip challenges children to find the answers to questions that require them to open their scriptures and use the Topical Guide, Footnotes, Chapter Headings and so forth. These come four to a page and can be printed and distributed to your entire Primary. Activity Pages - a full-page fun activity based on the monthly theme. to receive the monthly Search Slips along with a HOST of other Primary resources based on the current curriculum and theme. 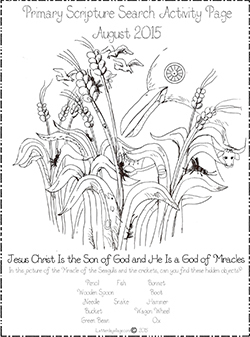 CLICK ON IMAGE BELOW TO DOWNLOAD THIS MONTH'S PRIMARY SCRIPTURE SEARCH ACTIVITY PAGE!